more photos at photo album here. The impact of this storm was so great that it is necessary to have a page dedicated strictly to The Storm which brought wind storms of hurricane force, then brought flooding which washed out Lewis and Grays Harbor counties. Our own family experience, here in Bay Center, in Pacific County, where everything came to a complete halt with the collapse of our county infrastructure tells also of how among communities, neighbors helping neighbors is what gets us through those early days of catastrophic storms. Since I am among those believing that climate warming is a reality and we are likely to see more, not less of unusually violent weather, I believe we all need to examine how to be as prepared as we can be and how we will need communities helping each other within their own communities. Avoiding panic-stricken behaviors that can result when people get frightened and scared, I am a believer in education and awareness, pro-active rather than reactive. I will add to this page as I collect resources, media stories, photos. Adding below. Telephone registration for assistance is available immediately for residents of Lewis County by calling 800-621-FEMA (3362). Online registration will be available beginning today at http://www.fema.gov. Individual assistance is only available to residents of Grays Harbor and Lewis counties. “All of the flood victims who contacted DEM (Department of Emergency Management) over the past week to report initial damage assessments to their property need to call FEMA to enroll in the assistance program. Once you are enrolled you will receive a claim number which will allow you to start the process of obtaining federal assistance. “I cannot stress enough how important this step is. Some people may believe the only report they need to make is the initial assessment report, but this is not true. Even if you are covered by flood insurance you still need to call FEMA in case there is some other assistance available to you. Citizens must call FEMA if they want to pursue federal assistance,” DEM Deputy Director Ross McDowell said. 2. You will receive a claim number and be mailed a form (You will need to get a claim number in order to be eligible for any assistance). 3. Complete the form and mail it back in. 4. You will be contacted after the form has been reviewed by a FEMA inspector and may possibly have a site visit by them. 5. FEMA inspector will complete their report and you may receive a check in the mail. A letter explaining what was allowed and the use of that money will be sent. Federal disaster aid will be available to individuals and businesses in Grays Harbor and Lewis counties who need somewhere to stay, help with repairs or other assistance after last week’s violent storms and widespread flooding, officials said Sunday. Gov. Chris Gregoire said other counties may be added to the list after teams from the Federal Emergency Management Agency finish assessing the damage. Homeowners, renters and business owners in Grays Harbor and Lewis counties are advised to call 1-800-621-FEMA to register for assistance. Starting Monday, they can also register online at http://www.fema.gov . Individuals may be eligible for rent payments for temporary housing, medical and dental care, funeral assistance, grants to replace personal and business property, unemployment assistance for up to 26 weeks for those who lost their jobs because of the storms, and low-interest loans to pay for repairs not covered by insurance. Gregoire commended the federal government for its fast efforts to help people deal with the aftermath of last week’s storms. On Saturday, President Bush declared Washington’s flooding a major disaster, making federal recovery aid available to state and local governments. Sunday’s announcement expands the help to individuals and businesses, but only in two of the six counties affected by the previous declaration. People who have lost food because of the storm may be eligible to receive assistance through the state Department of Social and Health Services. Clients already receiving food assistance must report the loss to their local Community Services Office or Home and Community Services Office within 10 days in order to be eligible for supplemental help. They can also call 877-980-9180 to make a report. The state is seeking a presidential declaration of disaster, which would make food assistance available to people who would not normally be eligible. Under the Disaster Food Stamp Program, people are eligible if their homes have been damaged or they have lost income because of a disaster, if they incurred expenses while protecting their home during the disaster, or if they have no access to bank accounts or other financial resources. To apply for that benefit, go to www.onlinecso.dshs.wa.gov, visit a local office or call 877-980-9180. According to Washington State Department of Health, food cold to the touch or food that has not been above 41° F for more than two hours is probably safe to keep, use or refreeze. Unless a generator was employed within the first few hours of the power outage, your refrigerator was probably above 41°F the first day. All meat, seafood, dairy products or cooked food should be discarded. You should never taste suspect food. It may look and smell fine even when illness causing bacteria are present. When in doubt, throw it out. After two to four days without power, all perishable foods in refrigerators should be discarded .Even with proper refrigeration, many raw foods should be kept only for a few days before being cooked, frozen or throw out. Generally, the following items are safe even if they are not kept constantly cold: jams, jellies, butter, margarine, ketchup, mustard, pickles, relish and similar acidic condiments. Fresh fruit and vegetables keep well, too. Perishable foods in the freezer should be discarded if they are not cold to the touch or obviously thawed. Look for signs of defrosting, such as puddles under the refrigerator or freezer. Rain can damage roofs, siding, windows and doors, allowing water to enter attics, walls and indoor living spaces. Rising groundwater can enter basements and crawl spaces. Moisture is ideal for mold growth, which affects indoor air quality and can cause allergic reactions and asthma attacks. • Check attics, crawlspaces and basements for signs of moisture and water leaks. If you find wet or damp areas, dry them promptly to reduce the possibility of mold growth and other moisture-related problems. Mold can start growing within 24 to 48 hours. • Try to find the source of the moisture and fix leaks as soon as possible. • Clean up any mold you find. If items (carpeting, upholstery, insulation material, etc.) that become wet cannot be thoroughly cleaned and dried, they should be removed and thrown away. Other items and surfaces should be cleaned with detergent and warm water. If food gets wet, the rule is, “When in doubt, throw it out!” It’s not worth the risk to your family’s health. • Toss out all packaged and unpackaged foods, fresh and frozen, that have been submerged or splashed with floodwater, as well as any that have not been properly refrigerated. • Canned-food containers should be cleaned with detergent and warm water, then disinfected in a weak bleach solution before opening. If your septic tank or drain field is covered with water, do not use the system until the flooding recedes; this will prevent sewage backup in the house. • If sewage backs up, keep everyone out of the area, especially children and pets. • Wear rubber gloves and boots while cleaning, and clean with a mild bleach solution before rinsing (one-half cup bleach per gallon of water). • Wash your hands thoroughly and wash clothes separately after completing the cleanup. In flooded areas, surface water can enter and contaminate drinking-water wells. • If you are on a public water system, your water utility or local health agency will notify you of any potential problems. • If you have your own well, and your wellhead or the immediate area around your well is under water, assume your tap water is contaminated. Boil it for at least three minutes or drink bottled water until you can have it tested. Mitigation pays. It includes any activities that prevent an emergency, reduce the chance of an emergency happening, or lesson the damaging effects of unavoidable emergencies. Investing in mitigation now such as constructing barriers (levees) and purchasing flood insurance will help reduce the amount of structural damage to your home and financial loss from building and crop damage should a flood or flash flood occur. Learn if your neighborhood is affected by floods, seismic hazards, or landslides with King Coutny iMap. If you live in a frequently flooded area, stockpile emergency building materials. Make sure all family members know how to turn off gas, electricity, and water; and also know the emergency radio station to listen for information. A flood “watch” means a flood is possible in your area. A flood “warning” means flooding is already occurring or will occur soon in your area. Listen to 710AM or 1000AM for the latest emergency information. Store some water in jugs and the bath tub. Move valuables to higher ground. Get away from standing, flowing, or rising water. If you are driving and your car stalls, abandon your vehicle and head to higher ground. Listen to your emergency radio stations (710AM or 1000AM) and be ready to evacuate. Flood dangers do not end when the water begins to recede. Listen to a radio or television and do not return home until authorities indicate it is safe to do so. Remember to help your neighbor who may require special assistance – infants, elderly people, and people with disabilities. Stay out of a building if flood waters remain around the building. Throw away food – including canned goods – that has come in contact with flood waters. American Red Cross: The organization is asking for monetary donations only. To donate: 800-RED-CROSS or www.redcross.org. Donations meant specifically for the state’s flood victims should be designated as such. – Safely secure pets indoors or in a sheltered area since some animals tend to dart at the first signs of a storm. Have a power outage kit, including a flashlight with batteries, lantern, matches, glow-in-the-dark light sticks, wind-up clock, portable radio, manual can opener and mylar blanket. Use hot water sparingly. Most hot water tanks will retain heat for up to 24 hours. This can also be your source of emergency drinking water. Know how to manually override your electric garage door if you have one. Unplug sensitive electronic equipment. Switch electrical appliances off to prevent fires and equipment damage. Leave one or two lights on to let you know when service is restored. Dress in layers to conserve body heat. Close doors, windows, curtains and unused fireplace dampers to preserve heat. Use battery-powered flashlights for illumination. Avoid candles, oil lamps or anything with an open flame. Adequately vent fueled space heaters (e.g., kerosene, propane, alcohol) to avoid fatal carbon monoxide gas buildup. Keep refrigerator and freezer closed as much as possible to keep food fresh. A full refrigerator will maintain safe temperatures for up to six hours; a full freezer for up to two days. Discard at-risk refrigerated foods that are warmer than 45 degrees Fahrenheit. If in doubt, throw it out. If used incorrectly, generators pose a significant hazard to both the user and crews attempting to restore power. Plug appliances and fixtures directly into the outlets of the generator, not into your home circuitry. Be sure to use generators in a well-ventilated area. Beware of flood-related scams, including fraudulent home-repair offers, car sales and charity appeals. The first con artists on the scene are usually questionable contractors who promise immediate or cheap home repair and cleanup. Check with the Department of Labor and Industries to ensure that a contractor you intend to hire is properly registered. You can search online at www.contractors.lni.wa.gov or call 800-647-0982. Scam artists take advantage of disasters by soliciting donations for a bogus charity. You can confirm that a charity is registered with the Secretary of State’s Office by calling 800-332-4483, or search online at www.secstate.wa.gov/charities. Car shoppers should look out for vehicles damaged in the recent flooding. These vehicles may be cleaned up and offered for sale by private parties, auto auctions or even used-car dealerships. There are significant mechanical, safety and health risks associated with flood-damaged vehicles. Use an online vehicle-history tracking service like carfax.com to get more information about a vehicle’s past. — Link to Washington Governor Gregoire website to read the official accounts about this winter storm. — Gov. Gregoire’s Letter to President (pdf version), for text version, link here . — State of Emergency Declared for Pacific County, per article in Chinook Observer, Wed, Dec 5, 2007, link here . — WA Gov seeks storm aid, per article Bellingham Herald, Thursday, Dec 6, 2007; link here . Governor Gregoire and Rep. Brian Baird visit Tokeland; more info in article about South Bend/Raymond now with food shortages; death of woman in Pacific County (Seaview) using candles in power outage – ignited catching house on fire; Dr Lush, performs emergency cecaesarean at Willapa Hospital in South Bend which hasn’t had obstetric department for years; Pacific County Sheriff John Didion said about half the county was still without power as of Thursday – that during worst of the storm wind gusts of 147 mph reported – that as of Thursday going door to door to do welfare check on people who still don’t have power: 640 people were still in shelters; 33,000 without power; 18,900 without safe drinking water; and about 15 roads were still closed; fourteen water systems were shut down, and people using nine others were told to boil the water; nearly 400 National Guard members were deployed. — Local agencies react to storm as best they can despite tough circumstances, per article Chinook Observer, Dec 5, 2007. link here. According to County Commissioner Jon Kaino, Pacific County’s Emergency Operations Center was activated early Monday morning, but was unable to reach much of the county without any means of direct communication with residents. … read more at link. — Reports of towns east of Pacific County, Highway 6 into Lewis County on the way to Centralia, Chehalis. Pe Ell, Doty, Adna, Boisfort, Rainbow Falls Park. Link here. — Shoalwater Tribe Still Wating for Power, story at KING 5 news,, Friday, Dec 7, 2007. Shoalwater Indian Tribe in Pacific County. They have been waiting for nearly a week. Uprooted trees and ocean debris overwhelm the beaches of Willapa Bay, home of the Shoalwater Tribe. 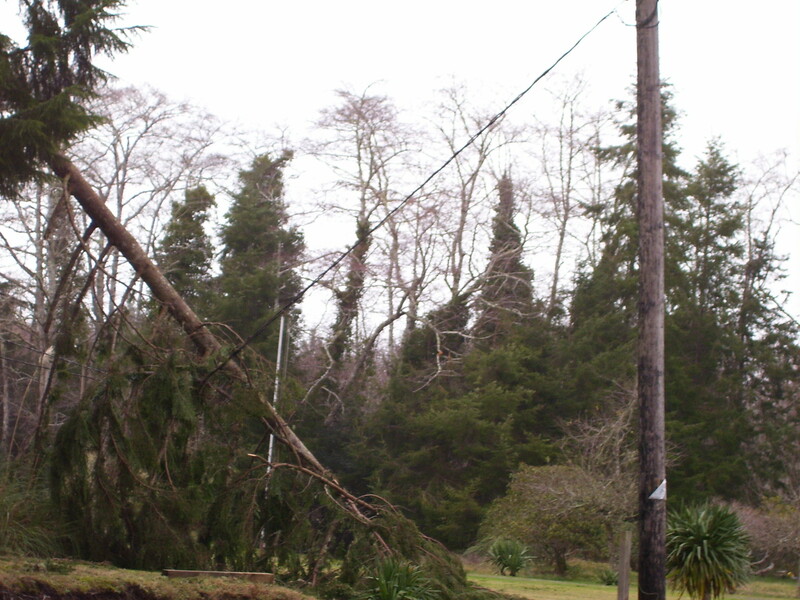 Immediate problem – six days without power. No power also means no gasoline pumps. Some getting around the old fashioned way – by horse. — State Route 6 Remains Closed West of Pe Ell, article at The Chronicle, Lewis County, Dec 10, 2007. Two landslides cut off small towns of Willapa, Menlo, Lebam and Frances on State Route 6 and also the communities of McCormick and Walville . State Route 6 to remain closed for two more weeks while road crews clear the landslides. Link here. — Disaster Food Assistance Program info for Grays Harbor and Lewis Counties, authorized for individual disaster relief, the food stamp disaster program is enacted, which has more generous eligibility rules and benefit amounts.link to video at KING 5 of Governor Gregoire introducing DSHS Secretary Robin Arnold-Williams and hear it first hand as she explains the program. Raw: Wash. DSHS head talks about food stamps after flooding December 10th, 2007 Robin Arnold-Williams, head of Washington Department of Social and Health Services, briefs the public on food stamp availability and crisis counseling after last week’s flooding. note: At this time it is applicable only in Grays Harbor and Lewis Counties for people who Live and/or Work in those two counties. report at KING 5 news, Sat, Dec 15, 2007 link is to KING 5 Top Stories, so I don’t know how long the url link will work – try google. It is also an AP story so should show up in other places. OLYMPIA, Wash. – Gov. Chris Gregoire says the federal government has added Mason, Pacific and Thurston counties to the federal disaster declaration for the storm and flooding that began Dec. 1. The governor said Saturday that the Federal Emergency Management Agency will help individuals and business owners affected by storm damage. FEMA previously granted individual assistance for Grays Harbor and Lewis counties on Dec. 9. Individual assistance helps residents and business owners with housing assistance, small business loans, crisis counseling and other programs. — Local agencies react to storm as best they can despite tough circumstances, per article Chinook Observer, Dec 5, 2007. link here. According to County Commissioner Jon Kaino, Pacific County’s Emergency Operations Center was activated early Monday morning, but was unable to reach much of the county without any means of direct communication with residents. … read more at link.Funding, feuding put flood project on hold, Seattle Times, Dec 5, 2007. When Washington lawmakers in 2003 approved an ambitious plan — the “nickel gas tax” package — to repair state highways, tucked inside was $30 million to help corral the Chehalis River. read more at link here. Did development, logging set the stage for disaster? Seattle Times, Dec 9, 2007. For more than a decade in the Chehalis River watershed, developers have been allowed to roll the dice. read more at link here. Logging Impact, Lawmakers Hold Hearing About Flood The Chronicle online (Lewis County), Jan 11, 2008. The human impact on Lewis County flooding was examined Thursday during testimony in Olympia, WA about logging practices and commercial development to the Senate Natural Resources, Ocean & Recreation Committee. read more at link here. Senator Cantwell gets $2 Million approved for Doppler Radar in SW Washington – Daily World, Aberdeen, June 24, 2008. A U.S. Senate Appropriations subcommittee has approved a $2 million request from Sen. Maria Cantwell for a Doppler radar and other equipment needed to track weather patterns along Washington state’s coastline. Read more at link here. This storm had nothing to do with “global warming!” In fact NOAA and others have stated that Pacific Storms would move further north, along with the jet stream. Was it global warming in the Columbus Day storm???? Get a grip!